So you ordered a new entry door to replace your old one. After that long deliberation on what door style and what material you’ll be using, you finally placed an order. But when the door finally arrives, you find out that the hinges and the knob are on the wrong side of the door. This can be a confusing—not to mention, frustrating—situation, as you would have to take the door back to the seller and replace it with the right one, which means you might need to wait all over again. Open your door and st and in the doorway with your back to where the hinges are. If the door is on your left, then it is a left-h and door, and vice versa. It’s that simple. However, there are exceptions to this rule. If your door swings outward (as with exterior doors such as patio doors) then this rule works in reverse. 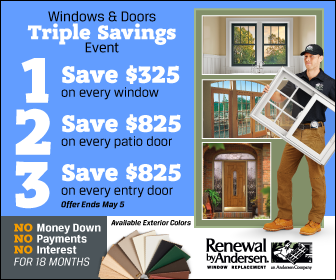 If you need any help with your doors and/or windows, Renewal by Andersen of St. Louis is always here to lend you a h and. We are the most trusted door and window expert in the region, and we offer different window styles, such as double-hung and picture windows, that will surely boost your home’s curb appeal. We also offer entry doors and patio doors in St. Louis, Chesterfield, Florissant, O’Fallon, and St. Charles. Just give us a call, and we’ll take care of your windows and doors for you. Call now!